Turkey’s currency has plummeted since Summer 2018. In fact, the lira decline was so dramatic that the Istanbul property market is now Asia’s cheapest in terms of U.S. Dollars. You can now buy apartments in Istanbul for well under US$1,000 per square meter (~$90 per square foot) outside the city center. Prime, central properties aren’t much more expensive. Searching on Turkish real estate portal Zingat will turn up luxury Istanbul apartments priced barely above US$1,500 per square meter. They sometimes even have unblocked views of the Bosphorus and other amenities. Home values this low are practically unheard of in any large, reasonably-developed global city like Istanbul. 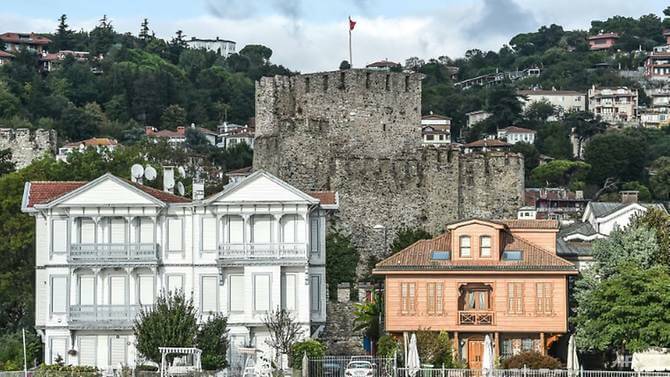 Wealthy Middle Easterners have started buying up luxury mansions on the Bosphorus. Turkish Lira Crash: What Happened? Now, the problem here isn’t with Turkey’s property market itself. Real estate values hardly changed since 2017 in terms of lira. Locals might not notice a difference in terms of affordability. 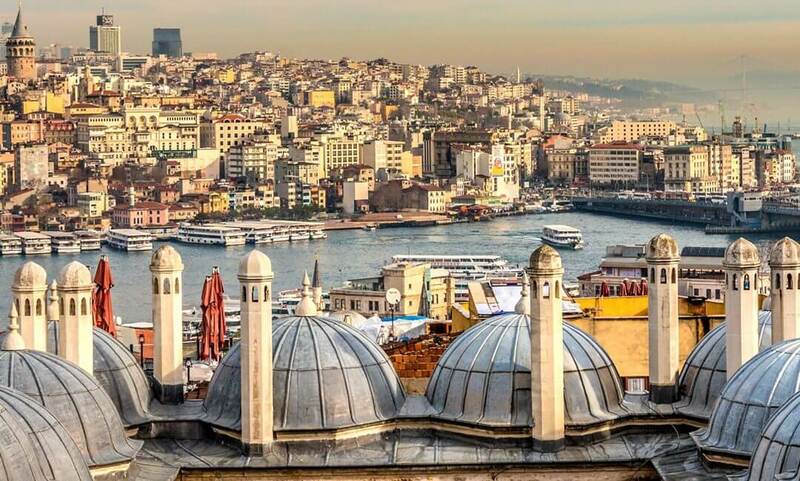 However, the lira’s crash means foreign buyers who pay with their home currency are now seeing 50% discounts on property in Istanbul and other Turkish cities. The lira promptly began declining in June 2018 following tariffs imposed by the United States. It was the climax of diplomatic feud between Washington and Ankara over an American pastor’s detention. Such a drastic move in the lira was perhaps more psychological than anything. Yet this event caused Turkey’s currency to fall from about 4.50 to the dollar to around 7.00 by August 2018. In other words, U.S. tariffs broke open some old wounds. The lira then proceeded to lose almost half its international purchasing power in only a few months. Tariffs themselves didn’t directly cause the lira’s decline. But they renewed existing concerns about Turkey’s economy. First, the nation suffers from a staggering amount of corporate debt. Turkish firms owed a whopping 70% worth of the entire country’s GDP as of late-2017. 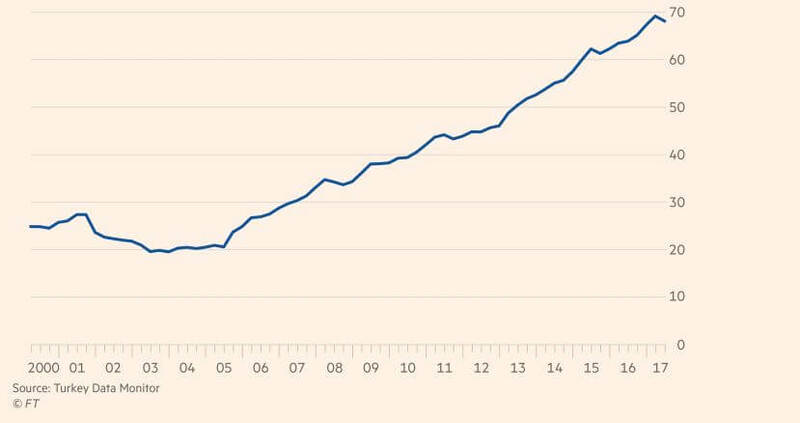 Chart showing Turkey’s debt to GDP ratio between 2000 and 2017. It’s certainly higher now since the lira’s 2018 collapse. It gets even worse once you realize most of this debt is denominated in US Dollars instead of lira. As such, the amount borrowers owe effectively doubled in six weeks since they must pay off their debt in terms of Dollars. Second, public money is being wasted on expensive infrastructure projects. Many of them are poorly thought out while few will ever become a net gain for the economy. “Kanal Istanbul” is one example. It’s a planned 50km canal running alongside the Bospherous and is expected to cost more than US$10 billion. The new canal has two big problems though. One, the Black Sea doesn’t get nearly enough trade to warrant its cost. Two, international law states transit through the Bospherous is free which makes a canal redundant. Lastly, Turkey has a management issue that won’t be solved anytime soon. President Erdogan essentially made himself the country’s lifetime leader through elections widely decried as a sham. While nonetheless loved by his conservative base, he seemingly doesn’t have a clue how to run an economy. Erdogan also recently appointed his son-in-law as Turkey’s finance minister. It’s either nepotism at work, or the best person for this crucial job is conveniently a relative. U.S. tariffs might have triggered the lira’s crisis. Unfortunately, Turkey’s problems are immense and go far beyond recent politics. Quite frankly, Turkey is a total economic basket case. Major structural issues aren’t being solved and will probably get worse before ever improving. Istanbul’s property market suffered from oversupply way before the lira crisis too. Large scale urban housing projects were creating a supply glut years ago. Plus, the Turkish lira has always held a worrying trend of depreciation. Did you make the mistake of holding the lira over the past 10 years? If so, you lost roughly 80% of your purchasing power. The lira has never shown itself capable of appreciating over the long-term. I don’t believe that will change. 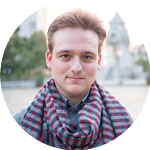 In summary: you shouldn’t fall into Turkey’s value trap. Property in Istanbul might appear cheap, but the nation’s crisis is only getting started. Don’t bet on a lira comeback. Consider buying real estate in places like Malaysia instead if you want foreign property along with currency comeback potential.